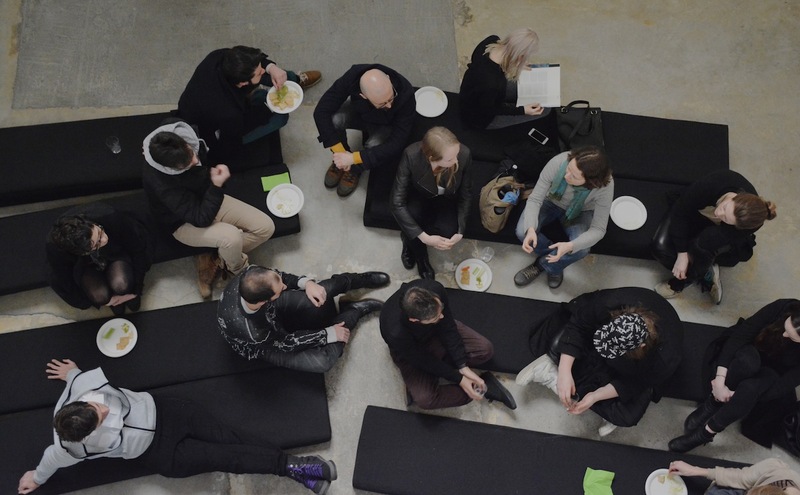 Two international artist residency centers formed the settings for one of the first interactions organized between New York and Helsinki via the Mobius program. In recent years, not only have artist-in-residence programs increased by number but also their role has become more and more significant in the production, distribution, and communication on contemporary art and artistic research in the globalized art world. Residencies also play an important part in many curators’ work. Through their Mobius fellowships, Boshko Boskovic, the Program Director of Brooklyn based Residency Unlimited, and Jenni Nurmenniemi, the Curator of HIAP – Helsinki International Artist Programme were able to undertake work exchange periods at each other’s organization tailored with the support of the Finnish Cultural Institute in New York. This short dialogue between the two curators aims to articulate their experiences of this exchange. Gaining insight into completely new cultural context by retreating from one’s everyday environment and professional routines and responsibilities was the main mutually set goal for the curatorial residencies. Each fellow took their personal curatorial approach to another, unfamiliar context while absorbing fresh ideas and ways of working from their new surroundings and residency communities. Besides getting to know their host organizations closely, both curators realized their own productions in New York and Helsinki. In January 2015 at HIAP Gallery Augusta, Boskovic curated an exhibition utilizing the collections and archive material of the Finnish Museum of Photography, with several new works commissioned from artists living and working either in Helsinki or in New York. For her part, Nurmenniemi curated a one night site-specific performative installation at the premises of Residency Unlimited in April 2015. The two projects were well-received and got direct continuation after the residency periods. A version of the exhibition Interpreting the Frame, curated by Boskovic, migrated to the Finnish Museum of Photography in Helsinki while the second episode of Nurmenniemi’s Deep Time Séance event will be re-staged at Kiasma Theatre in Helsinki in October 2015. 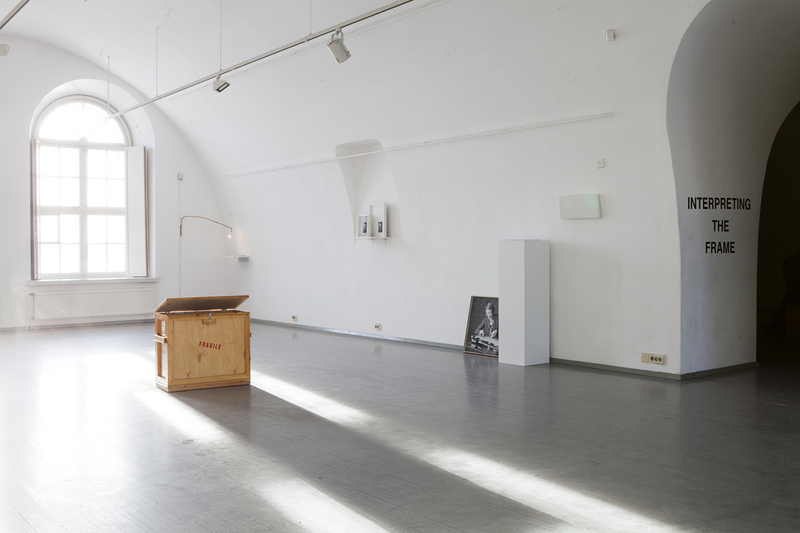 The following dialogue between Boskovic and Nurmenniemi aims to open up how they conducted their respective residencies at HIAP in Helsinki and Residency Unlimited in New York. B: Jenni, lets start with saying that your residency in New York was two-folded: one part was to curate and to produce your event, Deep Time Séance and the other to further your research on artists that foster multidisciplinary dialogue on ecological questions. Were there enough hours in a day to juggle the two while discovering New York at the same time? J: I would say that quite a bit of juggling was indeed needed in order to advance my main project at home, Frontiers in Retreat, which aims to create new thinking around ecology through contemporary art, while at the same time producing a kind of event that I had never curated before in a completely unfamiliar environment. Also, part of my residency was dedicated to meeting the resident artists and curators at Residency Unlimited and to learn from how you organize your program. All this resulted in a quite intense but invigorating two months. At the moment, there are two artist residencies, two curatorial residencies and one exhibition in the planning for 2016 – all these are direct outcomes from the meetings arranged by RU. B: While in residency, you had the opportunity to make studio visits with all the international artists in residency at Residency Unlimited, which at the time totaled 14. What was the most valuable thing that you got from these dialogues and are there any projects on the horizon that materialized from these encounters? J: It was unbelievably valuable to get to meet all the artists at RU. Many of them were working on themes relevant to my ongoing work, which aims toward rethinking ‘ecology’ and the meetings resulted in not only exciting discussions but also in concrete plans for future collaborations. At the moment, there are two artist residencies, two curatorial residencies and one exhibition in the planning for 2016 – all these are direct outcomes from the meetings arranged by RU. B: A residency is a temporal affair and supposed to be a time when one retrieves from the day-to-day operations. How did you structure your time in New York and were you able to “disconnect” from your duties at HIAP? I am asking this question since while I was in Helsinki during my residency I had to carve a bit of time for my professional duties with my organization which is a testament to the connectivity driven world that we are currently all experiencing. J: During the first weeks in New York, I was working quite closely on my projects at HIAP. However, I had tried to advance them as much as possible prior to my departure, so that I could be able to properly disconnect and attune myself into my new environment for two months. It is not such a long time to be away, after all. However, as you mentioned, in today’s constantly connected cultural landscape, it is nearly impossible to disconnect yourself completely. Thus, I stayed in touch with many of the people I am working with, the axis spanning from West Africa to Kainuu, Finland. I think I was able to find a nice balance between my various projects and to gain the much-needed distance from my regular ways of working at home. Every now and then I notice with HIAP residents that they seem continuously occupied with their other projects taking place elsewhere to the extent that in the end they don’t learn that much about their current place of residence. B: You worked with three Finnish artists for your Deep Time Séance project: Tuomas A. Laitinen, Matti Ahopelto and Jaakko Pallasvuo. Two out of the three were not present. How did this impact your choices and did the final outcome differ from how you planned it or imagined it? J: The choice of these three artists that I had recently been working with in Finland was based on my discomfort with the idea of landing in New York and having to curate a public event without any experience of the local cultural ecology nor dialogue with local artists just within 7 weeks time. I wanted to use the opportunity to create a completely unique, hard-to-categorize type of situation for RU’s amazing space, with artists that I have a close dialogue with and whose ways of working I am particularly excited about. Two of these artists’ contributions were planned in a way that did not require their physical presence. To be more concrete, with Pallasvuo, the whole idea was to transmit energies through his miniature sculptures, Energy Objects. In Laitinen’s case, the fact that his friend and trusted collaborator, musician Matti Ahopelto was present for the whole week of the event, made the whole performative installation possible. 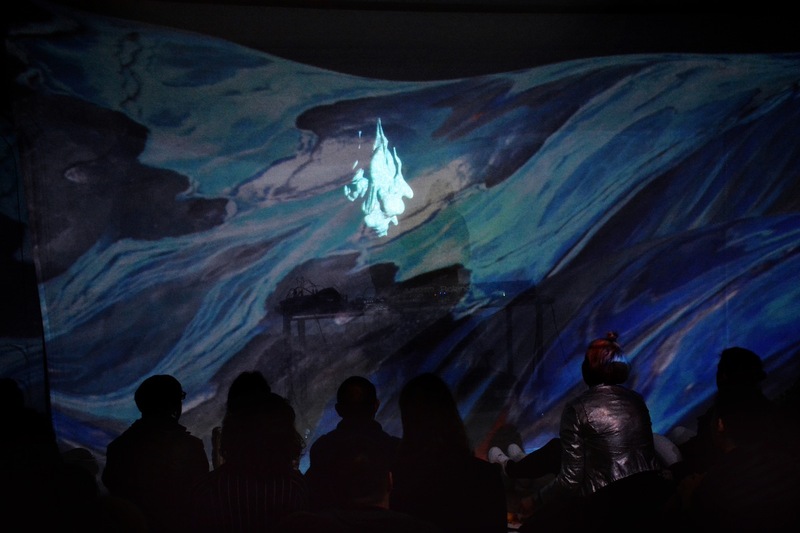 Their artwork was based on the seamless combination of Laitinen’s animated imagery and Ahopelto’s ambient drone music. In order to bring another type of presence to the situation, I invited New York based artist-physicist Tatiana Istomina (who I first met through your Mobius exhibition project!) to share stories related to the subjective yet shared ecological anxieties that sort of sparked the whole séance to begin with. B: What are the similarities and differences that you observed regarding how our respective residency programs, HIAP and Residency Unlimited function and operate? J: Comparing the two programs that operate with equal volumes but in radically different cities, I would say that RU is based on more structured networking, whereas things at HIAP tend to develop more organically. HIAP has only grown this big in the past five years, so I think I gained a lot of ideas how to further develop our networking and interlinking aspects as well as the planning and timing of public events. RU is extremely efficient in managing the huge number of residencies spread out in studios all across Brooklyn and Queens. B: You were in New York during the art fair week where fairs such as the Armory Show, Independent, Spring Break Show and Moving Image, to name a few, took place. What was your impression of seeing artworks in these circumstances? J: From the fairs that you mentioned, Independent seemed the most fresh and intriguing to me, there I actually had the rare sensation of being surprised. I loved that. However, instead of fairs and biennials, I generally prefer a bit less buzzing set up when looking at art. To me the most fun part was probably to get to see a few New York collectors’ homes and their passion for living with art. All in all, the art fair week gave a nice kick-start to my New York spring. The rest of the time I could then enjoy more quiet seminars, panels, and talks as well as gallery tours and museum visits. B: What are the things that you did not manage to do in New York and wish you had? Well, I really wish I had experienced the hot New York Summer! I left when the cherry trees were in bloom. J: Could you describe briefly how you formulated your project idea? What were the key thoughts and motivations behind the concept? Why did it take this form? What kind of process was it? B: The idea started from the desire to work with a group of Finnish artists who all have a photo based practice in one way or another. I also wanted to commission them to create new work for the exhibition that I was conceiving. I needed a framework where the artists reacted to something in order to produce new work. When I visited Helsinki for the first time I fell in love with the Finnish Museum of Photography and their rich collection. Through conversations with Ilari Laamanen from the Finnish Cultural Institute in New York it became apparent that we could approach the museum and propose to work with their collection for the exhibition that I had in mind. Sofia Lahti, the curator of the collection of the Finnish Museum of Photography was very receptive to the idea that the five Finnish artists (Jonna Kina, Liinu Grönlund, Tanja Koljonen, Juuso Noronkoski and Mikko Rikala) could conduct research on their collection. The process was two-fold – I had to study the collection myself first and then assign artists to particular collections from which they did their own homework and used it as an inspiration to create new works. I sort of continued the residency period at home, which was a fantastic thing and the luxury of having all this time and support from the Mobius program to dedicate to one project. J: On temporality: you were able to divide your residency into two parts. Could you elaborate on the reasons for this, and what kinds of implications this had for your Mobius experience? The first reason was a purely practical one since I was not able to take off from my work for 4–6 weeks in one go, so I had to divide it into two visits. This turned out to be a great thing for the project since it allowed much more time for research, dialogue and production. The implications for my Mobius experience were purely positive since I could stretch my residency experience, so to speak, into a period of 7 months rather than condensing it into a 1 or 2 month residency. My first trip was in June 2014 when I did research at the Finnish Museum of Photography, had meetings with all the Finnish artists and HIAP staff. Then I had a period of 6 months in New York where I had fruitful conversations with the artists, obviously not for the entire 6 months, but periods of time, when we were discussing their research of the photo collection, what they would like to do, how they would present the works, discussing the publication, writing an essay about the exhibition, etc. I sort of continued the residency period at home, which was a fantastic thing and the luxury of having all this time and support from the Mobius program to dedicate to one project. J: How did things work out in practice with the group of artists and so many institutional partners involved in your project: Finnish Cultural Institute, HIAP and The Finnish Museum of Photography? B: It seems like a lot: five artists from Helsinki, two from New York, several institutions and a graphic designer, but because we had this time of nearly seven months to prepare, everything went very smoothly and the process was really a pleasurable experience. I have to add that the Finnish Cultural Institute in New York, which runs the Mobius program, had complete trust in me, which made things very easy on my side. We had regular meetings every few months where I briefed them on my progress so everyone knew where I was at any given point in time. J: How did you feel about entering a new cultural scene (of Helsinki) that you had little previous knowledge about beforehand? B: Well, I have to say that I had visited Helsinki once before, just for a few days, so I had some knowledge, but definitely not a vast one. This was a great opportunity to deepen this knowledge and get to understand the scene better. I was very happy that I was able to visit places outside of Helsinki such as the annual Art Festival and the new Serlachius Art Museum in Mänttä. J: How do the ways of organizing residency programs at HIAP differ from RU, and what would you consider as similarities? B: The biggest difference between the two programs is that HIAP is more of a centralized entity, your gallery space, the studios and housing are all on the island of Suomenlinna with three studios at Cable Factory, whereas RU has one central location in Carroll Gardens, Brooklyn, studios in several locations throughout Brooklyn and Manhattan and housing throughout the city of New York. In terms of programs and how we schedule residents throughout the year I feel that the two programs are somewhat similar. J: What kinds of long-term consequences do you think there are of your participation in this curatorial residency exchange? B: I think I have created long lasting relationships with many Finnish artists and colleagues from institutions in Helsinki. I feel that my knowledge of the Finnish contemporary art scene has been broadened and I have created many more friendships in Finland altogether. J: Now after some time, what would you consider as the most important outcome of your Mobius fellowship? Probably the most important outcome for me was the long-term process of creating one exhibition and the beautiful publication designed by the talented Karolina Konieczna. J: If you could, would you do something differently? B: I would have somehow found a way for all the artists to be able to work with the collection of the Finnish Museum of Photography. In our case the two New York artists worked with other archival collections.